According to IBM Coremetrics Benchmark Reports, 2011 was a huge success for Thanksgiving weekend shopping. Online spending and mobile traffic took the cake with big increases from 2010. 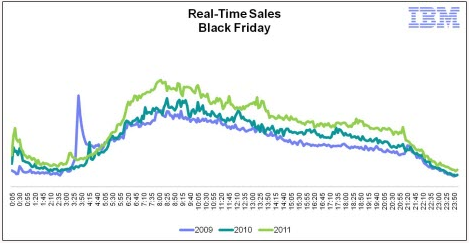 Black Friday 2011 saw a 24% increase in overall online spending from 2010. Not surprisingly, 4% of traffic and 9% of sales came from mobile devices, up from 5.5% and 3%, respectively. Leading the charge in mobile usage was the iPhone and iPad, with the iPad leading conversion rates at 4.6% versus the 2.8% for overall mobile devices. 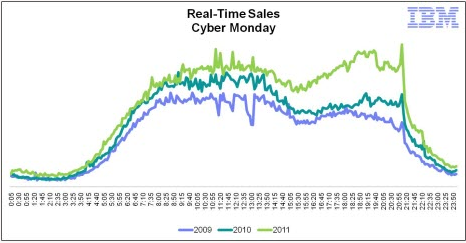 Cyber Monday fared even better with a 33% increase in online spending from 2010. Mobile traffic and spending didn't shine as brightly on Cyber Monday as it did on Black Friday 2011, but were each up almost 200% from Cyber Monday 2010, at 11% of traffic and 6% of sales. Aside from IBM's report, several others reported increases in Black Friday and Cyber Monday shopping this year. PayPal saw a six-fold, 516% increase in mobile volume payment and a four-fold, 371% increase in mobile customers compared to last year. According to ComScore, more consumers went online prior to Black Friday to research in advance of the day's events. So what exactly does this all mean? These strong numbers show us that the consumer shopping landscape is changing drastically and online stores and marketers need to be prepared to adjust accordingly. The way I see it, there were three big online and mobile trends from 2011 shopping that we need to watch. Mobile is Moving Forward Fast - make way for the era of "couch commerce". Consumers are browsing and buying more products on their mobile devices. Even excluding the online-focused Cyber Monday, sales from mobile shopping were up on Black Friday and even Thanksgiving Day. Research is on the Rise - with the easy access to product information, deals, and reviews, consumers are turning away from the crowds and toward the screen to research products before buying them. Whether searching for specs of a camera, bargains for a coat, or reviews on a mattress, shoppers crave additional information before making a purchase now more than ever. Social Sharing Influences - major brands like Target focused heavily on social network promotions. Several others put up specials on Foursquare. Though sales referred from social media outlets increased only for Cyber Monday (Black Friday saw a 3% decrease), the influence is still there. Social media discussions were up 110% during Thanksgiving shopping, with chatter and sharing of deals and online coupons, shopping tips, and how to avoid cyber scams. With consumers flocking to stores and sales, Thanksgiving weekend shopping serves as an excellent glimpse into general purchasing trends of the (near) future. It's important to keep these trends in mind as stores continue to explore online and mobile commerce and marketers try to rise above the selling noise.